Engage Agro Europe (EAE) specialises in crop enhancement and nutritional products for agriculture, horticulture, turf and ornamentals. These products are suitable for a wide range of crops and a variety of growing conditions. They address agricultural issues through improved agronomic practice. The company’s product emphasis at Fruit Focus was on improving crop health. Protecting the crop against biotic and abiotic stress is crucial. The benefits of enhanced plant strength increase both yield and quality. Sion is the latest development from EAE and will be officially launched at Fruit Focus. 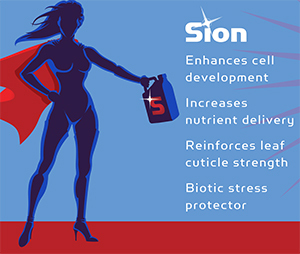 Sion is a new silicon nutrient for foliar and irrigated application to increase the strength, growth and health of crops. This fertiliser contains a unique form of silicon which provides a proven and balanced source of available silicon to the plant. It boosts the strength of cells and increased the speed at which growth can be created thereby increasing overall growth potential of the plant. Sion offers improved plant cell development as well as maintaining cell integrity and plant strength. It can also increase nutrient activity, alleviate abiotic and biotic stresses, and increase the resistance of plants to pathogenic pressure.